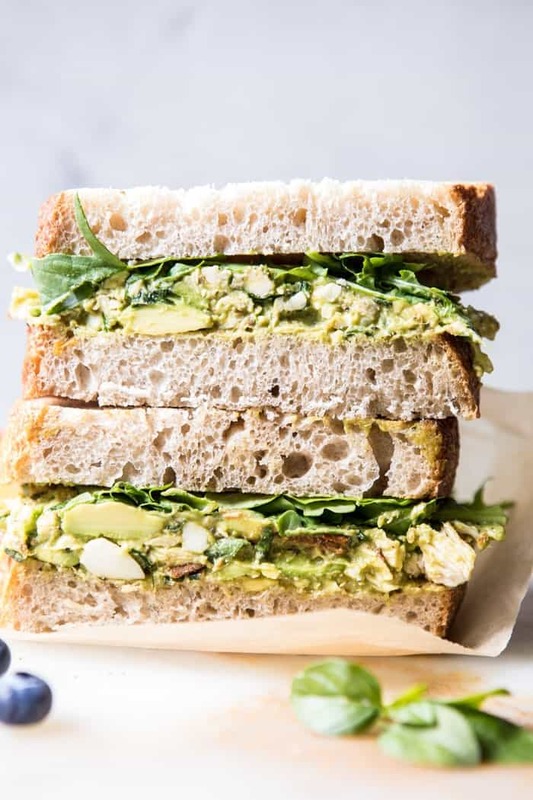 Mediterranean avocado chicken salad…on toasted bread…eaten as a sandwich…because that’s really the only way to eat chicken salad. If you ask me anyway. 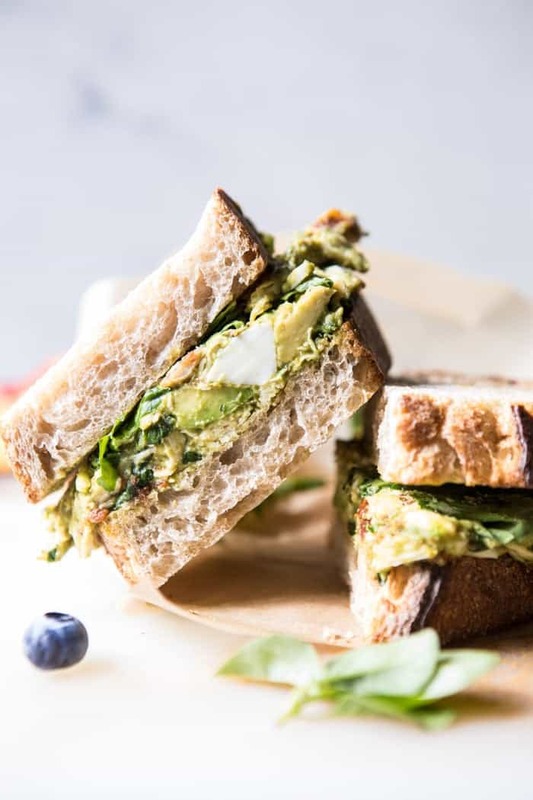 When I first started cooking, I’d make these smashed avocado and cheese sandwiches for lunch almost every single day. They were quick, easy, and so delicious. 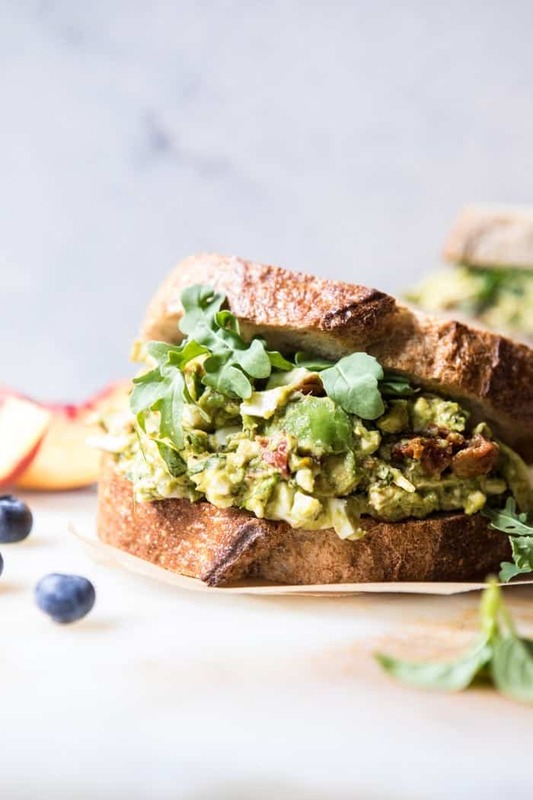 I’d use whatever we had in the fridge at the time, but typically it was smashed avocado, crumbled cheese (a lot of times I’d melt the cheese too…yummmm), and deli turkey. I used to make a ton of weird combos (think fruity jam + turkey + avocado + cheese), but everyone’s favorite was always the mediterranean style with plenty of basil, sun-dried tomatoes and feta cheese. 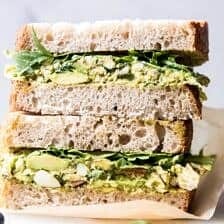 I kind of forgot about these salad sandwiches until I came across the avocado tuna salad recipe I have in the cookbook the other day (remember, it’s been a while since I wrote it!) and it got me thinking again. With the theme of the month being back to school, I thought it was time to break out this oldie, but goodie, of a recipe. 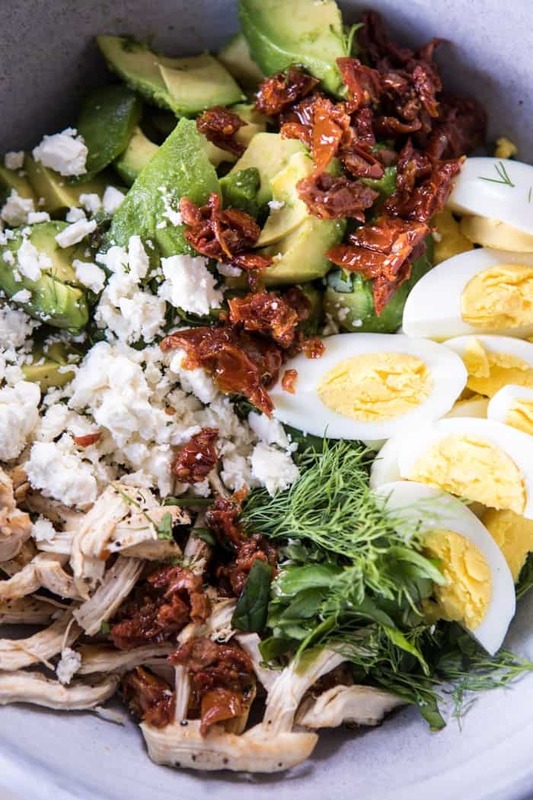 It’s a pretty simple concept, mash a little avocado, stir in some shredded chicken, hard-boiled eggs, sun-dried tomatoes, feta cheese, and plenty of fresh herbs. Toast up some really good bread, assemble, and eat! 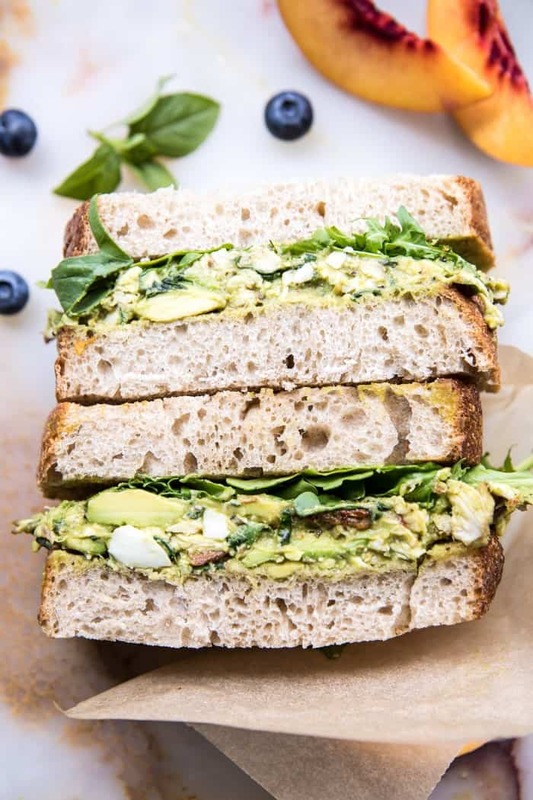 It’s literally a lunch you can make in ten minutes and it’s healthy and delicious. Yeah!! I love when such healthy things can also be crave worthy and just really really good. Bonus…this is one of those recipes that really isn’t a recipe. Meaning, you can add whatever you want and you really can’t mess it up. Use what’s in your fridge, what you love and or are craving, maybe add a handful more of cheese, and you’re golden. Also, and I’m not sure if this is a new concept or not, but I feel like using avocado in place of mayo is one of the best ideas…ever. To be honest, mayo just kind of freaks me out…well I guess if I don’t know I’m eating it then fine, but if I know it’s in my food…no bueno. <– when your brother lives in Mexico and no bueno becomes your favorite Mexican saying. 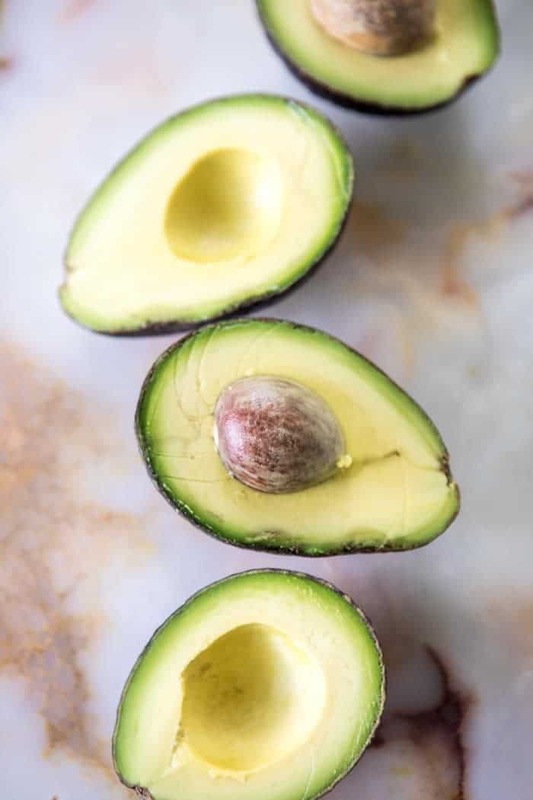 Does anyone else ever use this avocado in place of mayo trick? …be sure to use ripe avocados. there’s nothing worse than eating an under ripe avocado. the flavor and creaminess is just not there, and I promise, that’s going to ruin your chicken salad. Extra ripe avocados only guys! …also, try to use an avocado that is at room temperature. 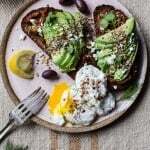 I’ve found avocados to have more flavor when they are not cold out of the fridge. …if you are cooking fresh chicken, I like to grill mine with a little olive oil, smoked paprika, lemon zest + juice, salt and pepper. Shred the chicken while it’s still warm and then toss it in the salad so that it’s a warm chicken salad, which is my personal favorite, but then I just love hot food. …use really good bread. meaning no white sandwich bread. I like a crusty whole grain seeded sourdough. And guys, like I mentioned above, this is really one of those recipes you can do whatever you want with. Have some bacon on hand? Throw that in. Don’t like feta cheese? Maybe try some crumbled blue cheese or goat cheese. Vegetarian? Stir in chickpeas in place of the chicken. Truly, anything can go as long as you love the flavors! 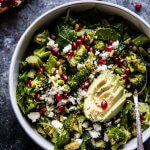 Oh, and if you’re looking to pack this salad for lunch on the go, you can make it the night before and keep it in the fridge. 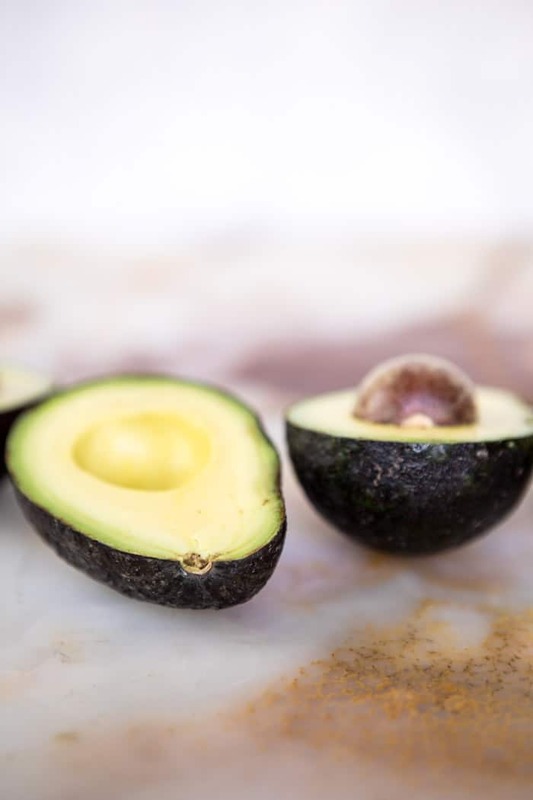 Because of all the lemon juice, the avocado doesn’t turn horribly brown and stays fairly fresh looking. It helps if you wrap the sandwiches tightly in plastic wrap though. And now you have the perfect lunch salad. Totally not boring, super yummy, and extra good for you…meaning shortcakes for dessert. Obviously. 1. Add the avocados to a medium bowl and lightly mash. Add the chicken, eggs, sun-dried tomatoes + 2 tablespoons of oil from the jar, the feta, herbs, lemon juice and a pinch each of salt and pepper. Stir to combine. Taste and adjust seasonings. 2. Spoon the salad onto toasted bread and top with arugula + another piece of bread. Enjoy! Happy almost Friday everyone. Have a great day! ps. thank you all so much for your kind words on yesterday’s post. My grandma is sadly not doing much better and my mom is going to be heading to Cleveland tomorrow. I will keep you all up to date. Thank you again for the support, it means so much to my entire family. I think I would omit the avocado, though, not really a fan. Thats totally okay, would still be yummy in my opinion! 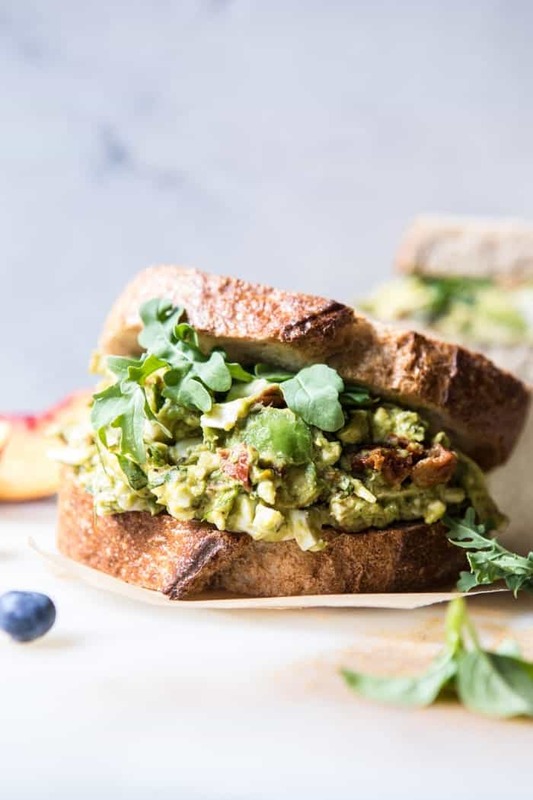 I’m all about chicken salad sandwiches AND recipes that aren’t recipes! This looks and sounds perfect. PS can’t wait for the cookbook. I pre-ordered it the first day on Amazon. I think it gets released a few weeks later in the UK, so I’ll be relying on lots of sneak peaks on IG and stories! Yay totally new you’d be into this!! Yes, I use avocado mashed in place of mayo in BLTs! Now we call them BLTAs… Really tasty sounding recipe, I will have to try this combo! Thanks for making it easy for us to make interesting food that we probably would not have thought up ourselves. Haha, BLTAs i love it! Hope you love my combo!! Thank you for trying my food Carol!! I just wanted to say I’ve been following you for over a month now and your recipes are wonderful. I love your delicious photos as well….Thanks for another interesting combo. I love chicken salad but most have mayo in them which I’m not crazy about. Thanks for a delicious substitute! Exactly my issue with them! So happy I could help show you a fun way to have them without mayo! YUM!!! 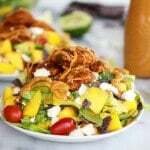 Love avocado chicken salad and am loving this twist! 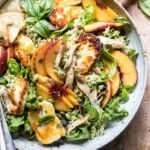 I love this healthy take on chicken salad – perfect lunch idea! I’m known for tweaking a recipe and I’ve made this recipe before and I used smoked chicken and it was wonderful! We have several BBQ places in my city and one local grocery store sells smoked chicken and I can get a leg quarter for the chicken salad. YES! Smoked chicken sounds delicious!! great addition of sun dried tomatoes! I need to pre-order your cookbook! It looks amazing friend! Thanks Lindsay!! SO excited your going to get the book!! Yay!! The Tuna Olive-cado Salad sounds awesome!! Cool to see what your making!! Thanks Krista! I am so glad you loved this! Thank you Liz! JUST made this!!! SO f’ing yummy (excuse the language)!!!! Haha so happy to hear that! Thank you Amy! Do you have a specific brand of oil packed sun-dried tomatoes that you would recommend? I’ve never used them before. Also, how long would you say this chicken salad would last in the fridge if there are leftovers? Super excited to try this recipe!